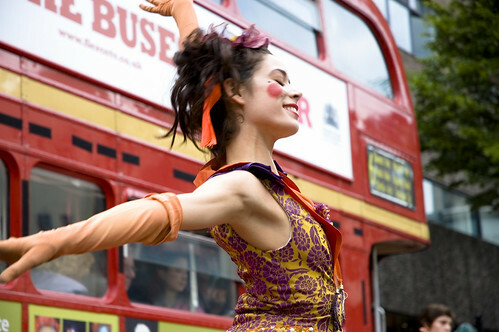 Photos from Ballet on the Buses are starting to appear. Here are mine (including the above), these are Matt Murtagh’s and Candice Smith has a few. There were loads of cameras out there (including, I noticed, a rather nice Leica, but I digress) so if you have any shots or even video online leave a link in the comments. If you missed the last two shows because they were during the working day and happen to have woken up early on Saturday morning you’re in luck because there’s another unpublicised performance at Victoria Square (outside the Council offices) at 11am. Please go. You won’t regret it. Cheers for mentioning this, Pete. This jumped out at me as the most exciting thing on the Fierce programme, but I wouldn’t have been able to see it if I hadn’t known about today’s performance and I wouldn’t have known about today’s performance if you hadn’t posted this.